First up, I just want to rave about the magic of blocking. 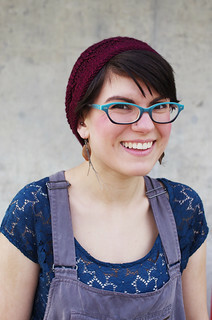 I finished knitting this little shawl about five months ago, but it was so... meh. It looked kind of ugly, to tell the truth. Sloppy and yet glossy, and too small to actually wear. But then I had a fabulous weekend about two weeks ago in which I blew off my homework for a few hours to block three pink shawls in a row. And let me tell you, I had never truly appreciated what blocking does for a piece. All of a sudden this little crumpled ball of yarn is light and big enough to wrap around my neck, with all the drape and crispness one would associate with silk. And the color, which had started to look sort of drab and unappealing, is almost the exact color of cherry blossoms, although in the wrong season entirely! The pattern was Shetland Triangle, I have no idea what size needles I used (US 8s, maybe? 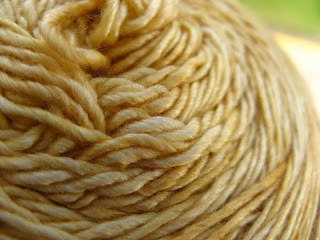 ), and I used 3 skeins of a sample colorway of Louisa Harding Grace Silk & Wool. Anyhow! Onto the yarn that hasn't been knit yet, although it's related because it's also a silk and wool blend. This is a skein of Mini Maiden that I got in Santa Barbara, at the amazing yarn store Loop & Leaf. I have to say that I'm very loyal to Smith's for my workhorse yarns, but as far as luxury, colorwork, and unique yarns go, this yarn store is hands-down my favorite yarn store ever. It was incredibly aesthetically pleasing, with hooks on the wall to hang the skeins, and little sections of each yarn: a corner for Handmaiden; a section for Habu (also, biggest selection of Habu I've ever seen); a section for Alchemy. Seriously, seriously wonderful place. I also purchased my copy of A Fine Fleece at this store. 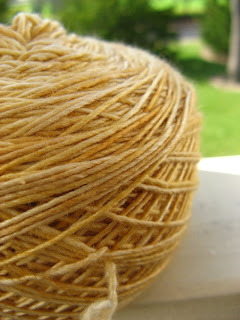 The yarn is a heavy laceweight, and I'm planning to use it for another project from Knitted Lace of Estonia. 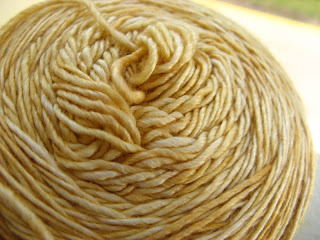 The color and hand is what drew me to it - I was really hoping to find a truly golden yarn, and this is it. I'm actually surprised that my camera was able to pick up the true color, but the photos above are pretty accurate. And, as usual, I want to cast on with it right now. However, research for my materials chemistry class is calling my name - and luckily, I was able to convince my professor (who was also my boss this summer at the nanotechnology company) that fibers and yarns totally have relevance in materials chemistry. So guess what my final project is on? Yeeeeah. Also, you are wearing jeans. ! Blend knitting and chemistry as much as possible. It's awesome. 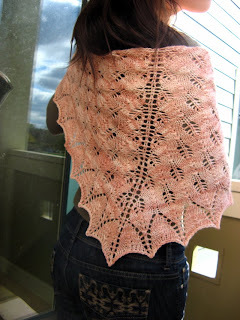 And I think lace is really the big thing that convinces most people of the miracle of blocking.